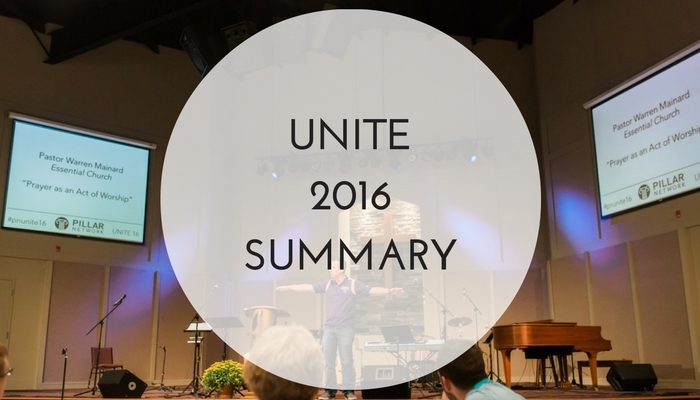 Unite 2016 was a huge success! The conference was held last week from 10/18-10/20. The theme of the conference was "Made to Worship in Community." Close to 200 hundred church planters, pastors, and women from all over the country attended the conference. The conference began with a pre-conference at Southeastern Baptist Theological Seminary. Providence Road (Pillar Network church in Miami) led in worship and then Providence Road pastor, Jose Abella, preached a great message in chapel. You can access Jose's message "Consider the Majesty of Jesus" on Mark 4:35-41 here. After chapel, the Pillar Network partnered with NAMB to provide a complimentary lunch and various TED talks and panels from church planters and Southeastern professors. The conference began at Open Door on Wednesday, October 19th. We had a session on "Praise as an Act of Worship" by BT Burke and "Preaching as an Act of Worship" by Duce Branch. We also had the opportunity to hold several breakout sessions. On Wednesday evening, the Milioni's served their famous home-cooked Italian meal and Matt Rogers and Bill Curtis presented on the visionof the Pillar Network for 2017. On Thursday, Warren Mainard preached on "Prayer as an Act of Worship" and we provided a second round of breakout sessions. Thank you to all of our volunteers who made this conference a success. We are thankful for everyone who attended and we look forward, Lord willing, to seeing you next year!